Gemstone jewellery has always been my guilty pleasure. It reminds me of going to Wales when I was younger - Barmouth to be exact and walking in what I would call the 'hippie stores'. My mum and dad would always allow me to go in as a holiday treat and pick out a little gemstone bracelet or a handful of gemstones in a little organza bag. It was something I always looked forward to. As I've got older, my appreciation towards gemstone jewellery has grown stronger. In a weird sense, wearing gemstone jewellery makes me feel connected with what is around me and to appreciate earths natural formations. You may feel like I'm going a little bit 'hippified' on you right now, but I'm that sort of person. I'm all for love and peace and plonk me in the middle of a field with a tent and campfire and I won't be worrying about my nails, I'll be getting out my guitar and singing campfire songs. It's what I grew up with, it's me. My brand in focus today is Zayah Jewellery. Zayah* specialises in gemstone jewellery with all their experts trained by the Gemological Institute of America and the London School of Jewellery. The company are also registered with the British Jewellery Association ensuring that all their pieces are of a high quality and standard. All of Zayah jewellery is created by hand at the design studio in London on the River Thames and each piece is issued with a certificate of authenticity to prove that all your gemstones are genuine materials. 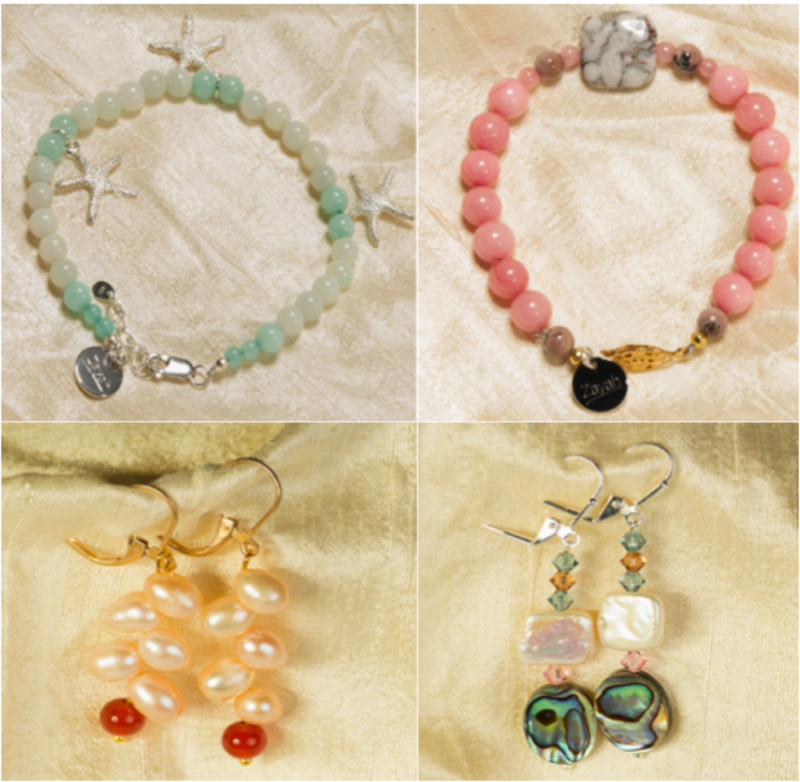 My favourites from the Zayah collection are the Serene Sea bracelet, the Ceres earrings, the Pink Pebbles bracelet and the Rhea earrings. Firstly, the Serene Sea bracelet reminds me of the spending time on my fathers boat. I've grown up as a sailors daughter, spending most of her time on the sea during my family holidays. I love everything about the seaside from the ice-cream to the smell of seaweed and the staring out at the ocean as I'm on the helm of the boat - it's idyllic, it's bliss. The second bracelet I love is the Pink Pebbles bracelet, I simply chose this because I'm very much a girly girl and I love the vibrant colour. Pink pastel shades are currently on trend at the moment and this bracelet is a perfect way to add colour to your outfit. The two earrings are have such wonderful colours - the pearls are delicately contrasted against the vibrant red and the turquoise and blue parts of the other pair reminds me of the earth. If you are looking for some new jewellery or feel like treating a loved one Zayah is a brand you should consider. Not only do they make exquisite pieces like the ones I have mentioned, they also create custom designs suited to every budget. Have you heard of Zayah jewellery?